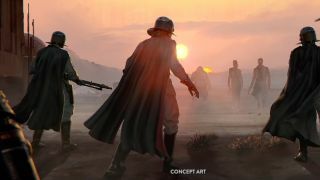 Star Wars games, especially those of the ambitious variety, are no strangers to development hell – the term that audiences and developers give games that are in limbo with on again/ off again production schedules and indefinite ‘TBA’ release dates. It happened to Star Wars 1313, a cancelled action-adventure game from now-defunct developer LucasArts, and now it looks like it could happen to Visceral Games’ still-untitled foray into the Star Wars universe. It’s happening because its developer, the aforementioned Visceral Games, has officially been scheduled for closure as of this morning. So, what’s to become of the Star Wars game? According to EA executive vice president Patrick Söderlund: a complete re-design. “Our Visceral studio has been developing an action-adventure title set in the Star Wars universe. In its current form, it was shaping up to be a story-based, linear adventure game … It has become clear that to deliver an experience that players will want to come back to and enjoy for a long time to come, we needed to pivot the design,” Söderlund said in a blog post. “A development team from across EA Worldwide Studios will take over development of this game, led by a team from EA Vancouver that has already been working on the project. Our Visceral studio will be ramping down and closing, and we’re in the midst of shifting as many of the team as possible to other projects and teams at EA. Closures for studios are never easy to report on, especially ones as special and unique as Visceral Games. This was the company that had developed the beloved Dead Space franchise, iconic The Godfather games and two of the better The Lord of the Rings games. The company began back in the late ’90s as EA Redwood Shores and has since done extensive work adapting films into decent, well-made games, while creating new popular IPs like Dead Space. Visceral was one of three EA-owned development studios known to be working on a Star Wars title – the other two being BioWare and DICE, the latter of which is releasing Star Wars Battlefront II on November 17, 2017.